Earlier this weekend I took a look at the long range view of the TNX (ten-year Treasury yield) going back to 1980 and on it posed the question whether the apparent double bottom (blue line) will form. How high will the rate arrow go if this over-stretched bow is released? ,,, and that will bring about the next stress test in this economic slingshot environment: how high can rates go without breaking the system's glass ceiling? If the arrow flies too high, it will crack the glass dome of the artificial econo-sphere we have been living in. Can we still breathe unadulterated, un-processed air? 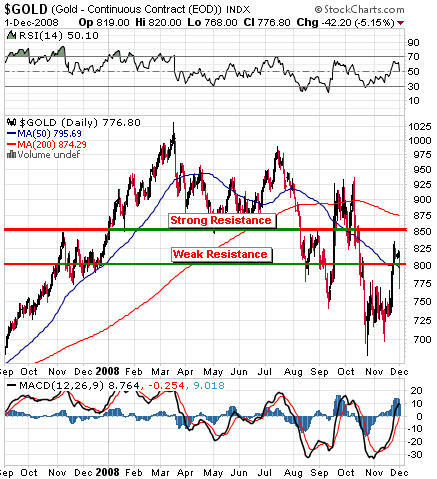 C-gold has recovered somewhat in the last two weeks and has poked its head through some weak resistance at the $800 level - which proved too powerful. Monday's news that the US is now "officially" in recession, combined with the realization that even China won't get off its multi decade monetary inflation spree scot free crushed world stock markets once more and dragged down commodities as well. However, c-gold remained strong all day today in Europe. 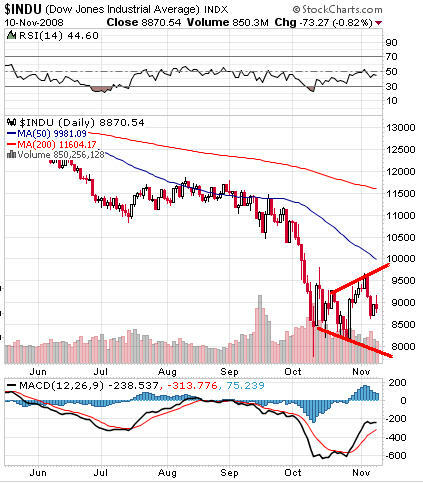 It remains to be seen whether it will recover the $800 level and stay above it. It depends largely on global public fear and the dollar. The prevailing mayhem and global financial slaughter has caused the global investment cattle to run for safety - back into the burning dollar-barn. Let's see how much heat these bovines can stand - and for how long. Paper is not exactly known for its fire-resistant qualities. Gold may liquefy under great heat - but by that time, the paper is already long gone. 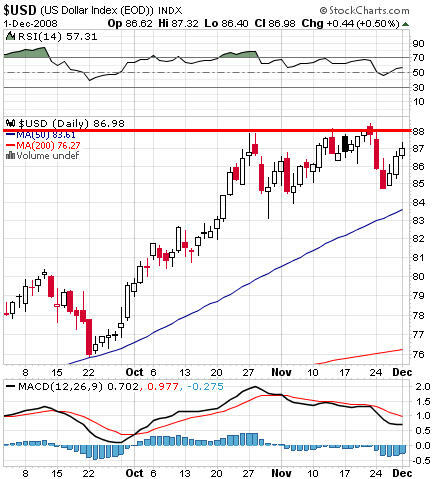 If the dollar cannot break through this level (that is not even a technical resistance point) - and soon - then c-gold will shoot up with vicious and most unsurprising speed. I already said that we are "very, very close" to the next powerful up-move in gold. Friday's c-gold (Comex-gold as compared to bullion) developments seem to have underscored that statement. 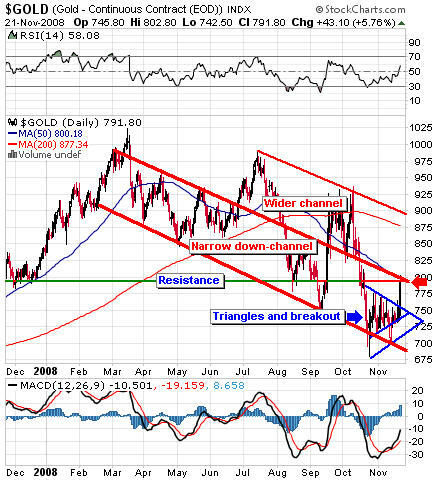 Friday's move has brought c-gold out of both the larger and the smaller blue triangle formations. The price now touches the descending blue 50-day moving average line. That point of contact also lies right on the horizontal resistance line, as well as the upper boundary of the narrow down-channel, so we are at a crossroads, of sorts, right here. What c-gold did in London today lends further support to the possibility that the doldrums days for gold are over. Also noteworthy is that silver poked its head back through the $10 level in London. Ifby any chance you have any cash lying around your house (or under it),please give the possibility of buying some serious amounts of gold via GoldMoney due consideration. If you have enough to buy kilo bars or even thousand ounce bars, more power to you. Buy physical, by all means, but everybody else should seriously think about buying gold and silver at the safest source outside of physical arms-length transactions that exists today. Goldmoney even offers a chance to gold-fund IRA accounts to Americans now. If you don;t do it, you will bite yourself, just like I bit myself when I saw the following chart. In 1982 I owned 30-year bonds. It wasn't a huge amount, but it was a nice sum. The interest rate back then was north of 16 percent per year! I sold them so I wouldn't lose a down payment on a stupid condo I had bought before. Being in your early twenties has its advantages in some ways, but they can cost you in the form of stupidity. If I have kept the bonds, reinvested the interest and blown the down payment, I could have made a fortune. I would sell them today without a second thought. US government debt prices will not stay this high. Given where they have gone and where gold is now, I would sink every last penny of it into gold at this point. Hindsight is 20/20, as they say. I blew my chance then - so please, don't blow yours today. You have probably heard of Larry Edelson's recent essay on what he thinks the G-20 powers are concocting behind closed doors. 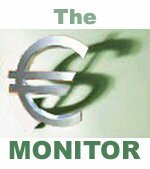 It goes pretty much in line with what I have been writing about for a long time - that the powers that be have come and are continuing to come to the painful realization that they just can't totally make it without hooking their monetary concoctions at least in some way to gold in the long run. Larry provides much more detail, though. We will talk about his views more in the upcoming December Monitor. while c-gold (Comex gold) is steadfastly refusing to go - and stay - below $700 an ounce. 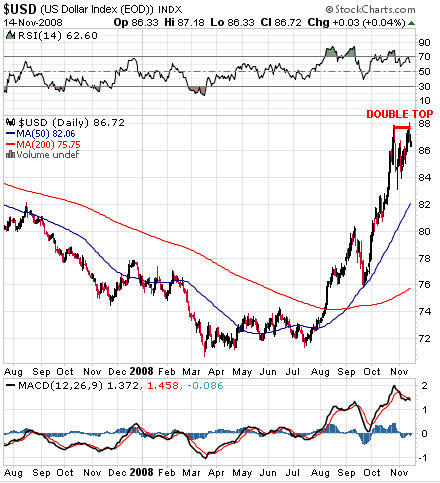 What's an even better sign is the fact that the press is beginning to realize that there are indeed limits to the dollar's recent tremendous bounce, as indicated in the last blurb posted on the Monitor Members Google Group. September's US real (inflation-adjusted) exports shrank 7.8% - the largest monthly drop since 2001 - and that happened only one month after the dollar began its extraordinary recent rise in August. Remember that the falling dollar was not long ago celebrated as the main cause for the country's considerable export recovery during the early part of this year. Now, even that party is over. In December we will get October's export numbers, and they will likely show a slower rate of deterioration of US exports. That's because in September, the dollar corrected a bit before rising again, keeping exports a bit more on the competitive side of the field. Nevertheless, October's super-sharp dollar rise will draw a big fat "X" through any expectations that exports may recover again, and that data will show when the October numbers are published in January. Too bad for the US economy - and too bad for the dollar. Even thick-skulled currency traders will soon recognize this inevitable factoid - and will start trading accordingly. 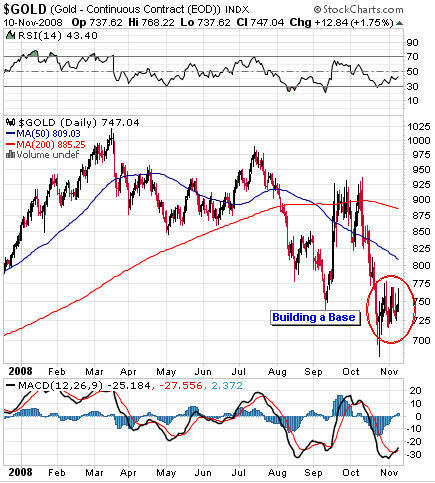 Say good-bye to the dollar bounce, and 'hello' to the resumption of gold's bull market, even on the Comex charts. Until then, the longer the dollar stays at current elevated levels, the faster US export data will deteriorate, especially since world trade as a whole is contracting at an increasing pace. Once the dollar starts to fall again, Indian gold buyers will be able to load up on cheap old again. The buying season s not even in full swing yet. So far, the rising buck has deprived them of the joys of gold-splurging because it kept gold relatively expensive in rupee-terms. All in all, the stars don't seem to be too well-aligned for the buck - but they are looking brighter and brighter for gold the more time passes. ... just as the dollar is starting to look quite a bit toppy. This doesn't necessarily mean that gold will go up from here and the dollar down. That depends on how many more UK and European banks are having to call their dollar-loans to emerging countries back in to cover their own asse(t)s.
Te chart above reveals something else, though, and that is how sudden and abrupt the dollar's recent rise was compared to its earlier decline. The blue vertical line separated these phases visually. 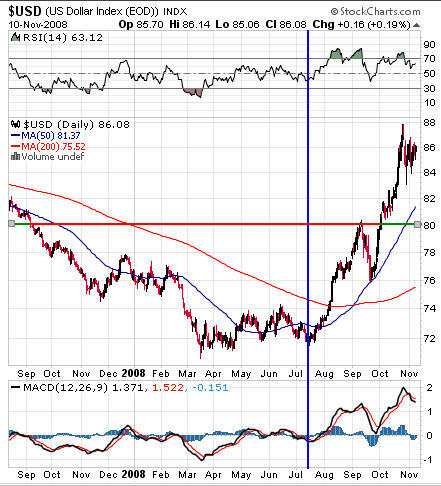 Itmeans that the dollar has not built a powerful bowl-dhaped base from which to climb long term. The bounce really does look more like a blip, from a longer-term perspective. We will have to wait and see. This perception alone, together with the fact that the dollar has indeed been the world's only full-fledged reserve currency until very recently does give it an edge - but that edge is pointing in the wrong direction. It is about to cut the US economy's wrist. The longer the dollar stays this high, the worse, so in that respect the recent strength is quite good for gold's longer term prospects. The Dow, on the other hand, is not building a base. It rather looks like further deterioration can be expected. That megaphone type pattern just doesn't look too convincing. Gold's huge advantage over stocks of any kind lies in the fact that its fundamentals are improving in spite of the recent deleveraging craze - or rather because of it. 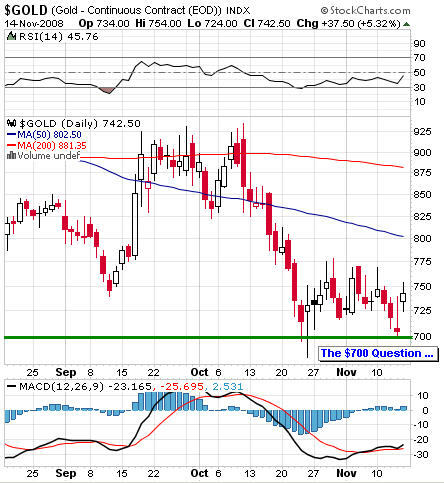 There is a definite bottom to gold prices, and we are there. The same thing cannot be said for stocks quite yet. Gold doesn't have to report quarterly profits to be attractive to investors. 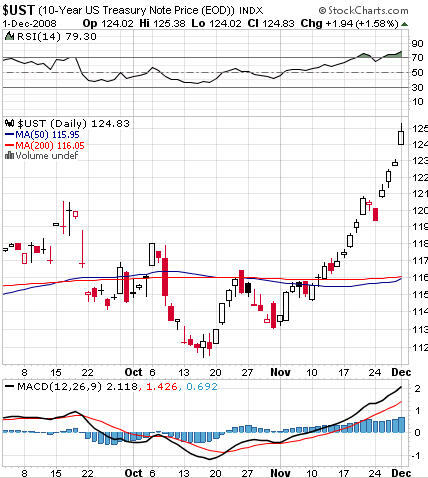 It doesn't need below-market interest rates to wring out yet another bull run. All gold needs is for the deleveraging to fizzle out, and that will happen sooner rather than later. While gold has been forming a base, gold stocks have simply bounced in recent weeks. 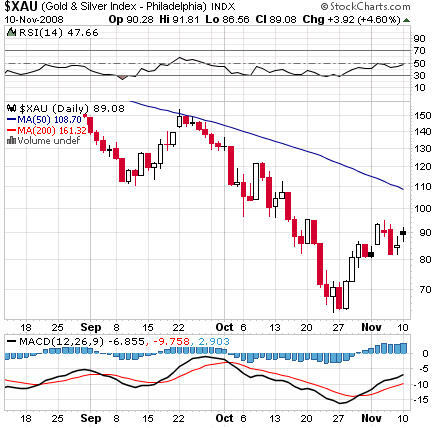 Here is the XAU. The HUI doesn't look much different. Any recovery in gold that is actually led by gold shares is a good sign. By now, all of the onerous production cost burdens that have weighed gold and silver stocks down in recent years have been worked off, for the most part. Oil and therefore transportation and energy costs are way down. Raw material costs like steel etc. have completely cratered. Mines had to lay off manpower and cut back production. Therefore, when gold starts its next leg north, the miners will be in much better shape than they have been for some time now to take advantage of the renewed interest from investors who will, by then, have precious few alternatives. 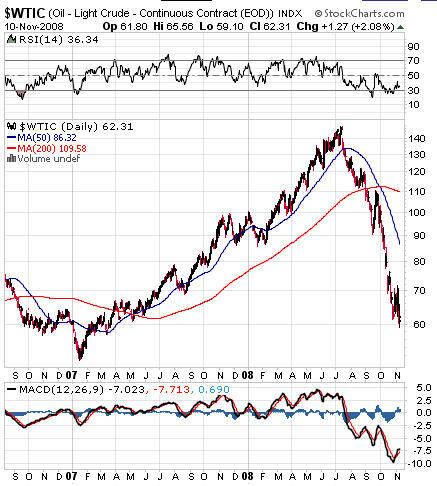 Oil is now back at the level of two years ago, but the Saudis are cutting output and China is outdoing the West in terms of fiscally stimulating itself, so in the near term, there should not be any further significant price drops. With oil supported, gold will also tend to be supported, even though that relationship has been totally overplayed by the press. If it was really so strong, why did gold fall after March when oil sped on to its historic heights until July?